Jian Xiao does not get it. If you take an organocatalyst and combine it with a metal it no longer acts as an organocatalyst. It is just an organic co-catalyst. Look up the definition of an organocatalyst. The concept of merging organocatalysis with transition metal catalysis is silly. Unfortunately Xiao is not alone in his delusion. A quick literature scan reveals a bunch of cooperative organocatalytic/metal catalysis research by various groups (examples: DOI, DOI) notably that of McMillan who introduced the concept of cooperative catalysis in the first place (example DOI). The Xiao publication in Organic Letters (DOI) deals with the enantioselective alpha-alkylation of aldehydes with a masked carbocation, a theme visited by researchers on many occasions since 2007. 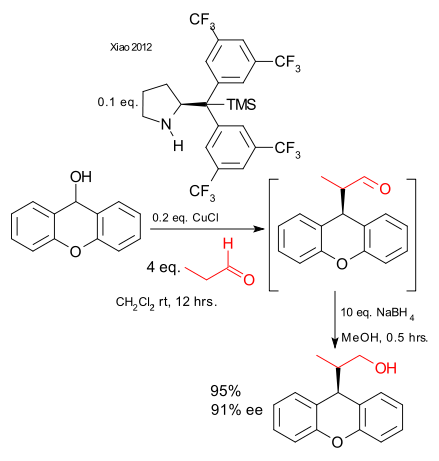 In this variation the aldehyde is propanal or butanal and the masked carbocation for example xanthydrol is activated by Lewis acid copper(I) chloride. The aldehyde is activated by a chiral secondary amine forming the enamine and is also the chiral auxiliary. This reaction is enantioselective allright but it comes at a price: the amine is huge (bad atom economy) and in contemporary chemistry, a metal loading of 20% is no longer considered catalysis. On the upside substrate scope is definitely extended.